New York Graphic Society, 1979. First Edition. Hardcover. As new/as new. SIGNED COPY - New York Graphic Society, 1979. Hardcover in pictorial dust jacket housed in the publisher's original shipping box. First Edition, First Printing (stated). Yosemite and the Range of Light. Introduction by Paul Brooks. More than one hundred magnificent photographs, reproduced under Adams's supervision, capture the awesome beauty of Yosemite Valley and the Sierra Nevada, ranging from the intimate to the panoramic in scope. Elegantly HAND-SIGNED by Ansel Adams DIRECTLY on the title page (NOT on a Time-Life bookplate or or Associates of New York Graphic Society bookplate). BOOK CONDITION: As New; a tight, bright, clean copy in a Fine brodart protected dust jacket housed in a Near Fine shipping box lightly bumped on one corner. A beautiful, highly collectible, hand-signed copy of the true first edition of this landmark monograph still contained in the publisher's original shipping box. Boston: NYGS, 1979. First edition. Adams, Ansel. Oblong folio, 28 pp. of text, 116 full-page plates. Fine in the photo-illustrated dust jacket. SIGNED by the photographer on the half-title page. New York Graphic Society, 1979. First Edition. Hardcover. Fine/fine. SIGNED COPY - New York Graphic Society, 1979. First Edition, First Printing (stated). Yosemite and the Range of Light. Introduction by Paul Brooks. More than one hundred magnificent photographs, reproduced under Adams's supervision, capture the awesome beauty of Yosemite Valley and the Sierra Nevada, ranging from the intimate to the panoramic in scope. Elegantly HAND-SIGNED by Ansel Adams DIRECTLY on the title page (NOT on a Time-Life bookplate or or Associates of New York Graphic Society bookplate). BOOK CONDITION: Fine; a tight, clean copy in a Fine brodart protected dust jacket. A beautiful hand-signed copy of the true first edition of this landmark monograph. Boston, MA: Little Brown & Company ( NY Graphic Society ). Fine in Fine dust jacket. 1979. First Edition; Fourth Printing. Hard Cover. 0821207504 . SIGNED by Ansel Adams directly on half title page (not on a pasted-in publisher's bookplate). No inscriptions. Tight, clean and crisp, with dustjacket protected in a new Mylar cover. No remainder mark. Not price clipped. Not ex-library. ; 0.9 x 15.3 x 12.1 Inches; Signed by Author . New York Graphic Society, Boston, 1979. First Edition. Hardcover (Original Cloth). Near Fine Condition/Near Fine. Signed by Author. ADAMS, ANSEL. Yosemite and the Range of Light, Boston: New York Graphic Society, 1979. Oblong folio, second printing (created for Time-Life subscribers), pp. 28, 116 duotone plates, 1 (acknowledgements), maroon and gray cloth boards, signed by the photographer on a plate mounted on the free front endpaper. This was the last important book from Adams, who died in 1984.; introduced by Paul Brooks. Boards lightly worn with a few discolored spots. Jacket spotted at edges, no tears. New YORK GRAPHIC SOCIETY A FINE FIRST IN DJ. SIGNED. Book. Signed. FIRST.. Hardcover. Fine/Fine. 1982-02-02. New. Ships with Tracking Number! INTERNATIONAL WORLDWIDE Shipping available. Buy with confidence, excellent customer service! GROSSET A VERY GOOD FIRST IN CHIPPED DJ. FIRST. Hardcover. /Very Good. Book. Boston: New York Graphic Society, 1979. First trade edition. 116 Photographs. 1 vols. Large Oblong 4to (30 x37 cm. ). Original cloth in dust jacket. Fine. First trade edition. 116 Photographs. 1 vols. Large Oblong 4to (30 x37 cm. ). 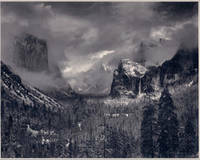 A marvellous group of photographs of the area long associated with Ansel Adams - Yosemite "During his lifetime Adams was arguably the world's most famous photographer, with reproductions of his works hanging everywhere from college dorm rooms to museum galleries the world over" (McDarrah & McDarrah, 3). Boston: New York Graphic Society, 1979. Frontis, 28p, , plates. 31x39cm. First trade edition. Maroon cloth back and gray cloth covers; dust jacket. Jacket price clipped. In fine condition. Boston, Mass. : New York Graphic Society, ca. 1981. Poster. 36 x 24 inches. Glazed in metal frame. Poster designed by Lance Hidy and printed by Gardner/Fulmer. Boston: New York Graphic Society, 1979. First edition. Signed by Ansel Adams underneath the half-title (not on a bookplate). Oblong folio. 28 pp. of text and 116 photographic illustrations. Publisher's cloth with gilt spine lettering. Dust jacket with two Adams' images in very good condition. Very good. New York Graphic Society, 1980 A near fine third printing, signed by Ansel Adams on a special bookplate for Time/Life on the front free endpaper. Very good dust jacket.. Signed by Illustrator(s). 3rd Edition. Hardcover. Very Good/Very Good. New YoRK GRAPHIC A FINE FIRST IN DJ. LIGHTLY FOXED. VERY LARGE.. Book. FIRST. Hardcover. Fine/Fine. 1992-03-05. New. Ships with Tracking Number! INTERNATIONAL WORLDWIDE Shipping available. Buy with confidence, excellent customer service! California: New York Graphic Society, 1979. Hard Cover. f/f. Landscape folio A fine copy in a fine dust jacket. in an archival mylar protective wrapper. This copy is one of a special editoin prepared for Time/Life books subscribers with the signature of the photographer Ansel Adams. Boston: New York Graphic Society, 1979. 1979 on title page and copyright page. Also "First Printing" stated on copyright page. A used looking copy under the dust jacket, but the jacket looks Vg minus or better. Has the publisher special signed bookplate mounted to the blank endpaper: "...a special editon prepared for Time/Life Books subscribers with the signature of the photographyer Carmel. California 1980" - and Signed largely and with flourish by Adams.. Signed by Ansel Adams. 1st. Hard Cover. Good/VG minus Dj. Folio - over 12" - 15" tall.